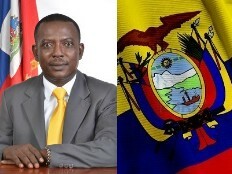 Friday, January 25, Jean Rodolphe Joazile, the Minister of Defence, left the country in the direction of the equator in the framework of bilateral cooperation in the field of Civil Defense, between the two countries. For this trip, the Minister was accompanied by 10 new scholarship students in Civil Engineering, as well as executives from the Ministry. With these 10 new students, the total number of students in training in Ecuador since October 2012 is 48 in order to give Haiti a real Corps of Engineers trained in the techniques of construction, carpentry, masonry, operation and maintenance of heavy equipment.